The “College Soccer Journeys” segment tells the true stories of former EXACT Soccer College Training Camp athletes pursuing their dreams of playing college soccer. If you are interested in being featured in “College Soccer Journeys”, or you would like to nominate someone to be featured, email EXACT Sports at Director@EXACTSports.com. 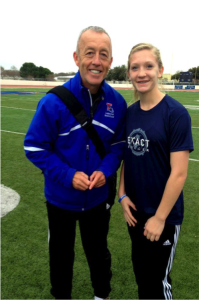 Speis (right) meeting Coach Kevin Sherry (left) at her first EXACT Soccer Camp in Dallas (Winter 2013). For Brooklynn Speis, the lifelong dream of playing college soccer will become a reality in Fall 2016. The rising senior from Midwest City, OK recently verbally committed to attend Louisiana Tech University to play Division I soccer under the leadership of Coach Kevin Sherry. Speis launched her college journey when she attended her first EXACT Soccer College Training Camp in Dallas, TX in 2013. It was there that she met and trained with Coach Sherry for the first time. The connection was immediate for Speis, as she recalls being particularly drawn to Coach Sherry’s passionate style of coaching despite meeting over a dozen coaches that day. After this first EXACT Soccer Camps experience, Speis was motivated and ready to dive head first into her college search. 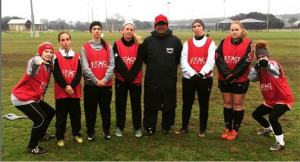 “The EXACT Soccer Camp not only gave me exposure to some of the best college coaches around, it taught me the mental side of soccer which I had never thought about. It also gave me new tools to start my recruiting adventure,” said Speis. For the rest of her sophomore and junior years, Speis launched into a college search that would include researching and contacting dozens of college coaches and programs. Speis’s development on the field progressed as well. She led the Carl Albert High School soccer team with 31 goals and 20 assists during her freshman and sophomore seasons as a forward. In her junior year, Speis changed positions and became one of the top midfielders in the state of Oklahoma, recording 9 goals and 7 assists. Speis’s success on the field garnered attention from a number of college coaches including Coach Sherry, who had been following her development. Coach Sherry reconnected with her in her junior year. 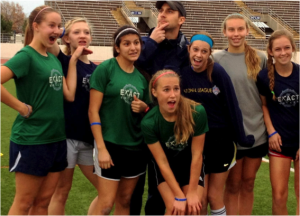 Speis (second from left) posing with her team during her first EXACT Soccer Camp in Dallas, 2013. “He sent me an email and said he remembered me from the EXACT Camp, and of course I remembered him,” Speis said. After her visit to Louisiana Tech, Speis agonized over a final decision for two weeks. She’d gained serious interest from multiple colleges through her search and had a lot to consider. Finally, a decision became clear. She trusted her gut, and on the morning of June 5th, Speis knew just what to do. Team fit was always a high priority for Speis, and she worked hard to find the right fit. Her connection with the Lousiana Tech players and Coach Sherry played a key role in her decision. With her decision made, Speis is focusing her attention on her soccer training and her senior year. But mostly, she is excited and looking ahead to her future on and off the field at Louisiana Tech. “Honestly, I can’t see myself anywhere else. I am so very thankful to all of my coaches, friends, family and supporters for helping me get to this point. But I am most thankful to the EXACT Soccer Camp for preparing me. I am so grateful,” said Speis. From all of us at EXACT Soccer: Congratulations Brooklynn and best of luck at Louisiana Tech! 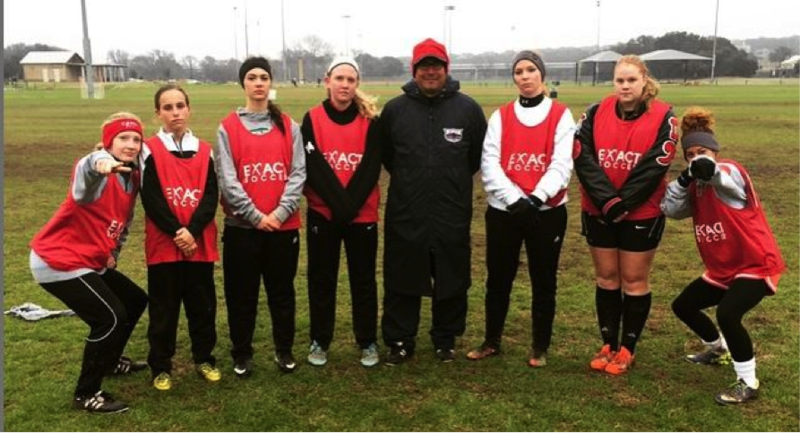 Speis (far left) and her team from the 2014 Austin EXACT Soccer Camp.